If you have incontinence you know how embarrassing it can be to deal with when you are in public. Incontinence makes it hard for you to do a lot of things that you used to do mostly thanks to the fear of having an incontinence episode. It is important that you use the right type of incontinence products in order to make managing incontinence easier. Adult cloth diapers are one of the products that you need to consider using as they are comfortable and form fitting. They can easily protect you from embarrassment when you are out in public as they will capture any of the urine that does leak out. The cost of cloth diapers is much cheaper from disposable as you need to continue buying more and more adult diaper when you purchase disposable diapers. Cloth diapers will be able to last for a longer period of time, making them cost effective and also environmentally friendly. The other thing with disposable diapers is that they have a lot of chemicals in them to absorb the urine and these chemicals may end up irritating your skin. One of the other great things about using washable diapers compared to the disposable ones is that you are also using environmentally friendly products as the disposable adult diapers are one of the things that just adds to more trash at the landfill. The only downside to using adult cloth diapers when you go out is that you will need to take home the soiled diapers with you. Unlike the disposable ones that you can just drop into the trash can you will need to end up dealing with finding a discrete way to bring them home with you. Fortunately there are some products on the market that plan for this. Search for disposable sacks that you can use when you have an incontinence episode. This way you can place your soiled diaper into the bag and then you can take it home to wash. You will need to carry an extra pair of adult cloth diapers with you when you go out as you will need to change them. 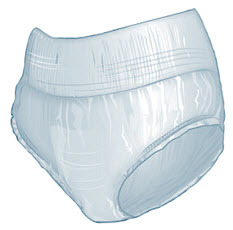 A great way to always be prepared is by leaving an extra pair of washable incontinence underwear in your car with a discrete sack that you can use to dispose of them. This will help you to always be prepare for an incontinence episode so you don’t need to walk around with a soiled diaper that can smell. To prepare yourself to go out you need to have a good understanding about your incontinence timing. Do you see that you commonly have issues every few hours? Knowing how often you have an incontinence episode along with understanding the amount of urine loss you lose will help you to pack adequately. You may want to pack 2-3 pairs with a discrete bag to hold them in so that you are properly prepared to deal with incontinence. Planning to have more is the best way to make sure you are properly prepared no matter what happens. One question you may be dealing with is how do I change the adult diapers? When you are at home and in the privacy of your own bathroom you know how easy it can be for you to change out your adult diapers and to manage your condition. When you go out in public you can easily have worries about it. The best option is to use adult cloth diapers that button on the side. This makes them easy to take off and you can easily slide them into a discrete sack. Managing incontinence when you are out doesn’t need to be a burden anymore with the right adult cloth diapers and helpful sacks to keep them discrete!